Lapis lazuli is an opaque rock made up of lazurite, calcite and pyrite. The name for this deep, vivid blue stone comes from the Arabic lazaward, for "heaven". Most material is from Afghanistan though some is from Russia or Chili. It is rarely found in North America. The blue and green stone is composed of azurite and malachite which have grown together, presenting a beautiful painting-like effect. This piece particularly reminded me of a topographic map. Azurite is named for its deep azure blue color and malachite comes from the Greek word moloche ("mallow") in reference to its leaf green color. 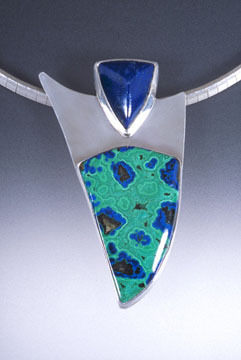 Azurite/malachite is found in copper ore deposits. This material is probably from AZ though other sources could include Chile, NV or UT.